Aliso Canyon, California’s largest underground natural gas storage facility, was cleared on July 19 by the California Public Utilities Commission (CPUC) and Division of Oil, Gas, and Geothermal Resources to increase injections above earlier imposed limits. The facility has been undergoing extensive testing since a leak was detected in October 2015 and stopped in February 2016. 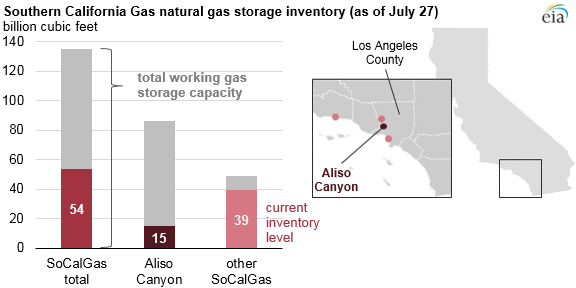 Owned and operated by the Southern California Gas Company (SoCalGas), Aliso Canyon has a total working storage capacity of 86 billion cubic feet (Bcf) of natural gas, or about 64% of the SoCalGas total. After the leak was detected, the storage level allowed by the CPUC was reduced to 15 Bcf, with any further withdrawals requiring regulatory approval. Once Aliso Canyon resumes limited operations, the facility’s maximum working gas storage level will be limited to a maximum of 23.6 Bcf, about 28% of the facility’s maximum capacity prior to the October 2015 leak. 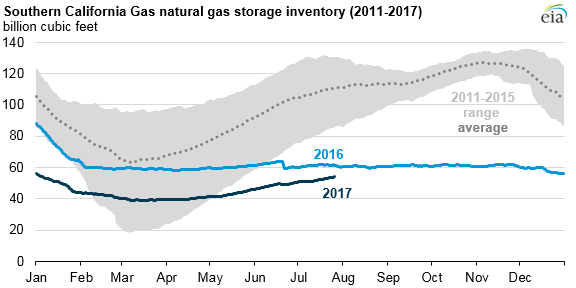 SoCalGas can withdraw natural gas when all three conditions are met: when natural gas is needed for reliability, after the other fields are at full usage, and after other steps have been taken to reduce or shift demand. As of July 23, those fields were collectively about 80% full, based on data provided by SoCalGas. Note: Field locations are approximate. Each of the 114 wells at the Aliso Canyon facility has been reviewed since the leak was contained. About 60% of the wells have been taken out of operation and isolated from the facility. The remaining wells are subject to several safety measures, including real-time pressure monitors, daily infrared leak detection, routine aerial monitoring for methane, and new steel tubing and seals inside the wellbore. California’s Senate Bill 380 directs the CPUC to work with the California Energy Commission (CEC) to consider Aliso Canyon’s future operations. On July 19, the Chairman of the CEC proposed the permanent closure of Aliso Canyon within 10 years. Earlier this year, a study commissioned by Los Angeles County stated that the storage facility was not necessary to maintain electricity reliability in the area, as demand response, energy storage, and energy efficiency could alleviate market supply issues. During times of high electricity demand, the California Independent System Operator (CAISO)—the electric grid operator for much of the state—has issued Flex Alerts. These notices encourage customers to conserve electricity by setting back air conditioning temperatures, turning off lights, and postponing major appliance usage until after 9:00 p.m. CAISO has issued two Flex Alerts so far this summer, on June 20 and 21. During the previous summer, three Flex Alerts were issued, with estimated demand reductions of around 500 megawatts. Energy storage, while still relatively small, has increased in the Los Angeles area. According to EIA’s preliminary monthly inventory of utility-scale generators (greater than 1 megawatt), a combined 62 megawatts of utility-scale battery systems came online in Los Angeles, San Bernadino, and Orange counties in late 2016. EIA’s Southern California Daily Energy Report provides daily metrics on the region’s electricity demand, natural gas sendouts, receipts, and inventories, and energy prices.